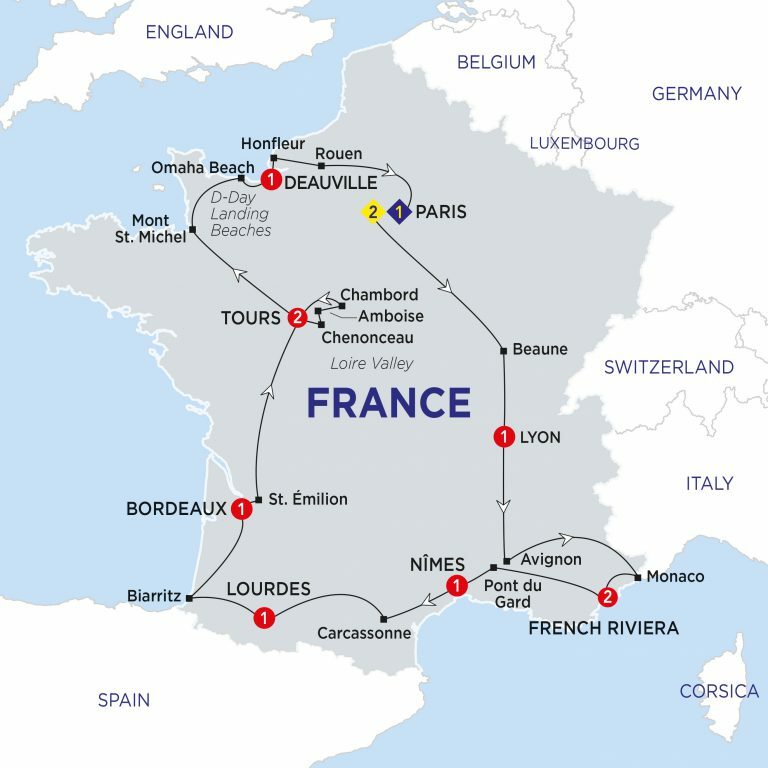 The wonderful tour of France allows you to spend quality time in many areas. Take time to relax in the beautiful surroundings of the French Riviera and Biarritz. Discover the glamour that is associated with the host to the annual film festival; Cannes. Visit the Loire Valley and St. Emilion famous for wine production. Be in awe of the D-Day landing beach of Omaha. There are a multitude of optional experiences for you to chose from to make your holiday your own. Enjoy a taste of local cuisine with a memorable dinner and drinks in typical Parisian style. Afterwards, driving through this amazing city, we’ll stop at scenic vantage points to give you opportunities to capture these fascinating sights on camera. In summer, this trip may take place before sunset. This morning your orientation features views of the Eiffel Tower, Champs Élysées and the Arc de Triomphe. Spend the rest of the day as you wish or join an Optional Experience to a Parisian Cabaret. Dominated by the soaring Sacre Coeur Basilica, you’ll join your Local Specialist to explore Montmartre’s winding streets, unusual galleries and world famous Artist’s Square – once home to the works of Toulouse Lautrec and Picasso. You’ll have time to browse, barter for original art and taste local cuisine, for a real flavour of Montmartre life. Come with us to explore the magnificent cathedral at the heart of Paris, Notre Dame. With your Local Specialist, you’ll also enjoy the Latin Quarter and have free time for a bite to eat. Then relax on our River Seine cruise, the perfect way to discover the city – don’t forget your camera. Visit medieval Beaune, the wine capital of Burgundy. Arrive later in Lyon, a dynamic cultural city. Enjoy an orientation tour en route to your hotel. Enjoy an evening drive along the beautiful Saône River and taste the most acclaimed French cuisine. You’ll discover Lyon’s secrets, from the Gauls to the medieval old town. A UNESCO World Heritage city, Lyon is also the gastronomic capital of France and our chef will prepare a mouth-watering three course dinner, with local wines included. Enjoy a scenic drive south to Avignon to view the Palace of the Popes and St. Bénezet Bridge. Then continue to the tiny Principality of Monaco on the coast. Finally drive to your hotel on the glamorous French Riviera. Relax and experience the Côte d’Azur’s sophisticated atmosphere. Perhaps laze on the beach and sip cocktails in a shady terraced bar, shop for the latest fashions or explore the town of Cannes famous for its film festival. First we’ll travel to the medieval hill top town of St. Paul to visit this artists’ paradise. We’ll continue along the Riviera, travelling on the Basse, Moyenne and Grande corniche roads with their spectacular views, to a local restaurant for a delicious meal including drinks. View the Pont du Gard, a Roman aqueduct spanning the Gardon River which was built in the 1st century AD to supply water to the nearby towns. Continue to your hotel in Nîmes. Drive to Carcassonne for an orientation of this walled medieval town. Visit Lourdes nestled in the foothills of the Pyrénées to view the basilica on top of St. Bernadette’s Grotto. This evening there is an opportunity to join a procession by torchlight to the basilica with the pilgrims – a magical and moving experience. Drive westwards from Lourdes to the Atlantic coast. In the glamorous resort of Biarritz explore the chic boutiques and watch the surfers perform their stunts. Traverse the rolling countryside of Les Landes to classical Bordeaux. Join us on a beautiful drive up into the Pyrénées, where we’ll catch a funicular train to ascend through mountain pastures to the top of these magnificent mountains, finding ourselves in Spain. You’ll have time to enjoy some Basque hospitality before our descent, with a drink included. Weather permitting. Enjoy a scenic drive to the hilltop village of St. Émilion which is famous for its wine. Continue past the strange buildings of Futuroscope, the amusement and science theme park at Poitiers, to the Loire Valley. Discover the most famous wine region in the world with a tasting at an historic French Chateau. Explore the underground cellars, learn about the wine-making process and why Bordeaux wine is so well known. Listed as a National Heritage site, this family-owned vineyard is truly an experience not to be missed. Your Local Specialist takes you on a fascinating visit to Chenonceau, a fairytale château built across the River Cher, home to priceless collections of Renaissance art and furniture. Your journey continues through verdant countryside. View the imposing castle at Amboise, where Leonardo da Vinci is said to be buried and view the splendid Château de Chambord. Tonight why not try delicious local Touraine cuisine? You’ll discover the charm of Tours, bustling city of St. Martin and Renaissance kings, and its Old Town on this evening tour. You’ll also enjoy Touraine cuisine in a traditional restaurant. Head north through the picturesque countryside of the Loire Valley and Normandy. Visit Mont St. Michel and view the abbey. Then continue to the historic D-Day Landing beach and the American cemetery at Omaha Beach. Arrive later at your Normandy hotel in Deauville, the elegant resort renowned for its racecourse, harbour and international film festival. Explore the picturesque harbour at Honfleur on the Normandy coast, a summer haunt of the impressionist painters. Drive through cheese and cider country to Rouen, where Joan of Arc was burned at the stake, and view the impressive cathedral. Your day ends in the glittering capital, Paris, where you may consider an Optional Experience to a local restaurant. Say ‘au revoir’ to Paris, your Travel Director and newfound friends at the end of a memorable holiday in France. Transfers are available to Charles de Gaulle Airport. Conditions apply.